Marvel Comics has been around since 1939. Back then, Timely Comics, as it was known, had yet to formally specialize in superhero stories, but still created such characters as Namor the Sub Mariner and The Human Torch (not the Johnny Storm version, though). Timely became Atlas Comics in the 1950s, but by 1961, they formally adopted the Marvel name, a moniker which has stuck to this day. Over the course of many decades, Marvel has published countless crossover events, massive storylines that changed the status quo, and brought countless characters together for massive battles, hopefully inspiring readers to collect more titles for their weekly "stack." Some of these stories were successes and some were failures, but many of these stories were filled with wildly complex and esoteric plots, especially for readers without an encyclopedic knowledge of the characters and the infinitely-crowded Marvel Multiverse. For those looking for a primer on Marvel's most famous stories, here are 15 Confusing Marvel Storylines, Explained. Get ready, because this is just the first of several entries that will focus on New York City's favorite web-slinging vigilante. One More Day was written to return Spider-Man to his old-school status quo, making Peter a bachelor once again, all without forcing him to messily divorce his wife. By this point, Spidey had long been married to Mary Jane Watson. In the issues leading up to One More Day, Peter Parker's beloved Aunt May is mortally wounded by a bullet that was meant for Parker himself. Despite her being at peace with dying (the woman must be 150 years old by now; she's lived a full life, to say the least), Peter can't accept the responsibility for her death, and goes off to undo his mistake at any cost... So much for "With great power, comes great responsibility" right? Parker eventually makes a deal with Mephisto, Marvel's version of the Devil, who agrees to alter reality to save May's life, but the cost is Peter's marriage to Mary Jane, which many fans thought was really cool and a great way to mature the character. After much deliberation, Peter decides to go through with the deal, much to the chagrin of Marvel fanatics everywhere. To say that the story is loathed by the fandom is an understatement. The follow-up stories, Brand New Day and One Moment in Time, were spent mitigating the damage and watering down the retcons of One More Day, but many fans still feel the burn of that ill-advised plot. 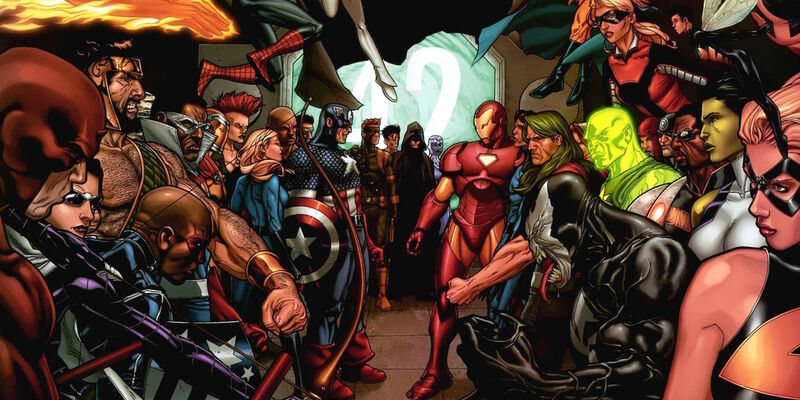 This 2006/2007 crossover brought practically every Marvel character together in an all-out war of ideology, philosophy, and full-on fisticuffs. While the key story was covered in its core seven issues, the effects of Civil War were felt and expanded upon in nearly every comic book released at that time. The setup is fairly simple; the New Warriors have a reality television series covering their exploits, but disaster strikes when villain Nitro self-destructs, blowing up himself, the New Warriors, and a nearby school. The death toll is nearly 900 souls. The public outcry leads to politicians calling for a "Superhero Registration Act," meaning all costumed heroes must reveal their secret identities to their government and work for SHIELD. Tony Stark and Reed Richards lead the charge on the Pro-Registration side, while Captain America and his allies become fugitives from the law, building an army of superheroes resistant to this change. After numerous battles and game-changing revelations (such as Peter Parker revealing his identity to the world, an act that would later be undone by a post-One More Day story), Steve Rogers wins the battle, but, shocked at the collateral damage to New York City, he surrenders, and the Pro-Registration side wins. Civil War was commercially successful, but was criticized for inconsistent writing and the outright fascist nature of the Pro-Registration side. Richards creates a robotic clone of Thor who murders Goliath, and Stark constructs what is essentially Marvel's version of Guantanamo Bay in the Negative Zone, where those who won't submit to registration are indefinitely detained. The Superhero Registration Act was repealed just a couple of years later, making the whole conflict moot as the universe slowly returned to the status quo. The biggest casualty of the Civil War occurred in its aftermath, and was actually unrelated to the Civil War itself; Captain America is assassinated as part of a plot by the Red Skull. At the time, his death was stated to be final, but the fans all knew that nobody stays dead in comics except for Spider-Man's Uncle Ben. Still, we didn't think his resurrection would be handled in such a ridiculous and unbelievable fashion, even by comic book standards. In Captain America: Reborn, it is revealed that the bullet that hit Cap didn't really kill him; it merely phased him out of space and time, sending him back into his own past, where he is reliving World War II but aware that something is definitely wrong. When Sharon Carter and company finally bring Cap's consciousness back to the present, they discover that Red Skull's consciousness has taken over Cap's body, as was his plan from the beginning. But Cap fights against Red Skull and is able to reclaim his body from his arch-nemesis. Alive again, Cap is given a full pardon by President Obama for his actions during Civil War, but it will be some time before Cap is willing to wield the shield again (more on that in a bit). In the meantime, he gives his friend Bucky his blessing to continue acting as the new Captain America. In House of M, Scarlet Witch loses control of her ability to alter reality. While Wolverine, Professor X, and Magneto contemplate whether or not she needs to be put down like a rabid dog, Scarlet Witch has a nervous breakdown that creates a whole new universe. 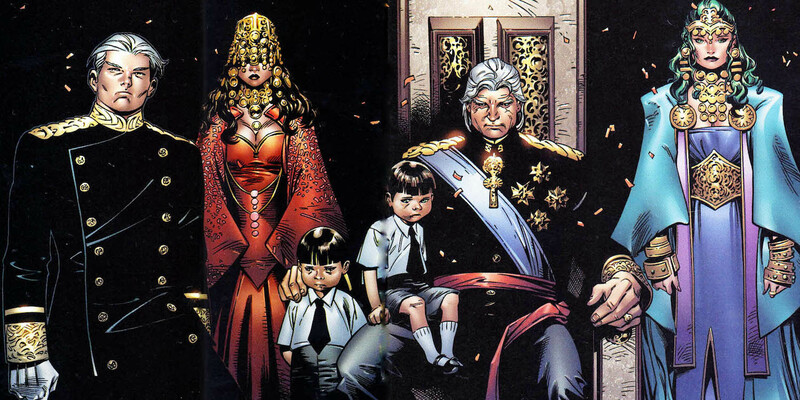 In this wild new reality, everyone has their greatest wish granted; mutants are the dominant species on Earth, with Magneto and his "House of M" exerting their dominion over humanity. However, peace is maintained by the wishes and values of Professor X. This new world isn't perfect, but, honestly, it could be a lot worse. Fortunately (or unfortunately, depending on your point of view), Scarlet Witch has another reality-shaking breakdown during a fight with her father and returns the Earth to its original state, with a catch; 99.9% of the world's mutants are stripped of their powers, including Magneto, Quicksilver, Professor X, and Scarlet Witch herself. Magneto and Quicksilver, among others, would go on to regain their Mutant abilities, but, moving forward, the X-Men and mutants in general would be greatly reduced in Marvel comics. 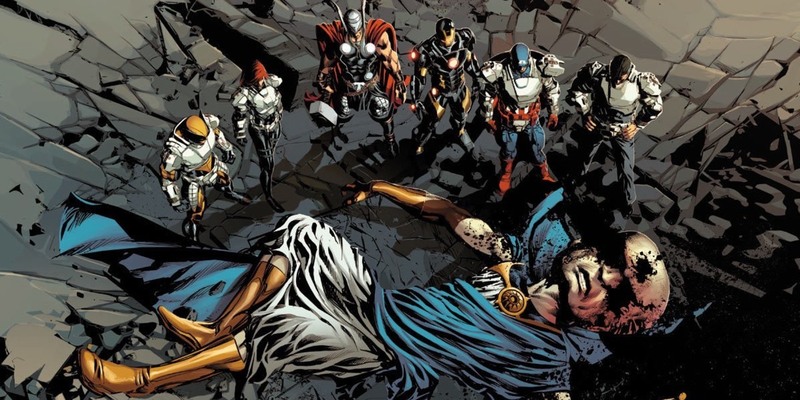 Original Sin begins with the death of Uatu, The Watcher. 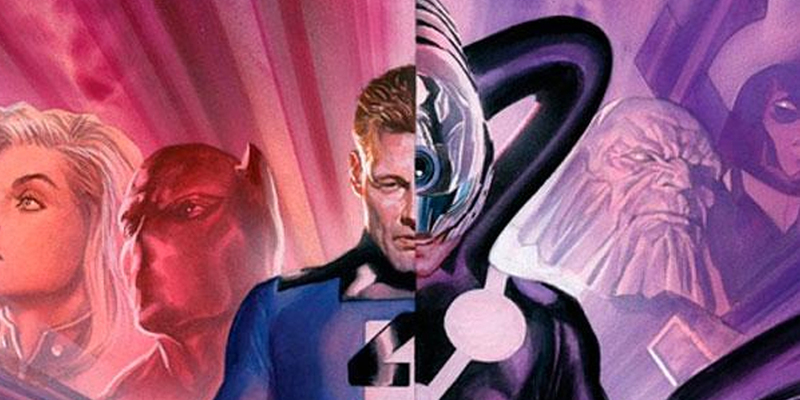 This Marvel mainstay first appeared in The Fantastic Four in 1963. He is found shot with Gamma-infused bullets, and his eyes have been stolen from his lifeless body,;a grisly end for the benevolent figure. The superhero teams split up and conduct their own investigations into the murder, slowly working their way to the truth: while Orb and Doctor Midas (two C-list villains) were involved, it was actually Nick Fury who killed Uatu, after The Watcher had already lost one of his eyes to Orb. His strict policy of non-interference meant that he could not go after it himself, and so he forced Fury to shoot him by faking an attack on him, knowing that Fury would then recover the other eye and ultimately become a Watcher himself. Fury's Infinity Formula, the serum that keeps him from growing old, had secretly worn off, but Fury had kept up appearances through an extensive network of Life Model Decoys of himself. This morbid tale ends with Fury killing Doctor Midas and becoming a Watcher. However, as punishment for killing Uatu, as well as Karma for his life of lies, subterfuge, torture, and other heinous acts committed in the name of national/planetary security, Fury is made into "The Unseen." He can see everything on Earth, but cannot interact with anyone or interfere in any way. Bucky, the erstwhile Winter Soldier, has taken Fury's place on Earth, and it remains to be seen when or if the original Nick Fury will return to the Marvel comics fold. Spider-Man makes his second starring appearance on this list, joined by the likes of Spider-Man, Spider-Man, and also Spider-Man. The Spider-Verse story is about Morlun and his family taking their crusade against Spider-Man to its logical extreme, and scouring the entire multi-verse for versions of Spider-Man to kill and literally devour. No Spider-Man is safe, from the Marvel 1602 version, to Spider-Moon-Man, to versions of the character from animated shows and videogames, with lip service even being given to the Tobey Maguire and Andrew Garfield versions of the character, among countless others. Heck, even Spider-Ham makes a scene-stealing appearance. After losing a ton of good Spiders, the survivors are able to take the fight to Morlun, ultimately banishing him and his crew on an alternate Earth devastated by nuclear holocaust, where they will be able to subsist on radioactive spiders. Gross, but appropriate. The Spider-Verse series is notable for balancing the numerous jolly Spider-Man personas with genuinely scary and violent villains, while allowing most of the Spider-Men to still retain their characterization and not just all bleed together, lifting themselves up and bringing out the best in each other. In 2011, Marvel published its Fear Itself crossover event, which features Red Skull's daughter, Sin, finding a mystical hammer, not unlike Thor, and using its powers to unleash a long-sealed evil. She releases Odin's brother Serpent who spreads fear in his wake. The main story of the comic deals with Thor and Captain America teaming up to save the day (2011 was when Thor and the first Cap film hit theaters, natch). 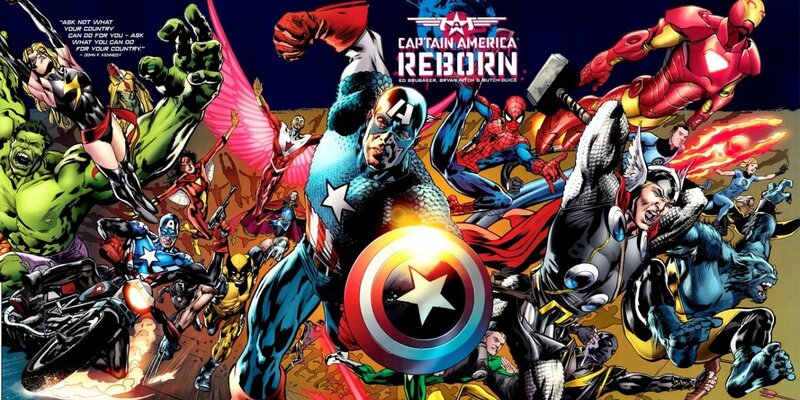 After Bucky is critically injured by Sin, or Skadi, as she is now known, Steve Rogers takes up the shield and becomes Captain America once again, after having given up the title following his resurrection in Captain America: Reborn. After getting his shield ripped apart by Serpent and suffering bitter defeat, Thor goes to Asgard to retrieve mystical weapons to give to his allies to fight against Skadi, Sin, and their evil compatriots. In the final battle, the heroes defeat the villains; Captain America wields Thor's hammer against Skadi, and Thor defeats Serpent, though at the cost of his own life. Once again, the status quo prevails as Cap's shield is repaired, becoming even stronger than before, and Thor is brought back to life in the story's epilogue issues. 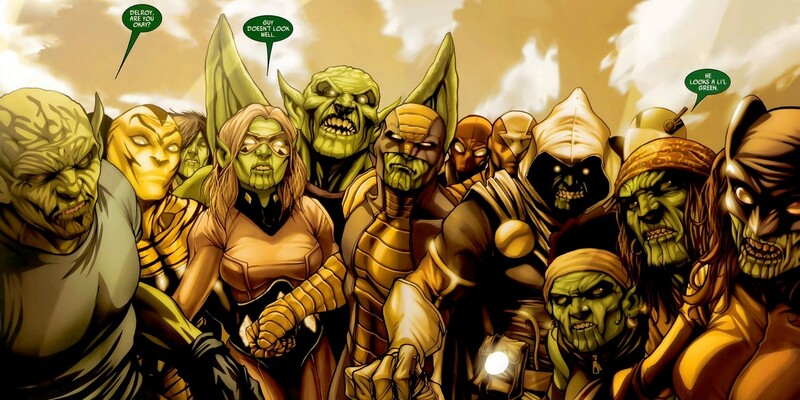 The extra-terrestrial Skrulls have been fighting against Marvel heroes since their 1962 debut in the pages of Fantastic Four (which is why they are co-owned by both Marvel and Fox), but they really stepped up their game during the events of Secret Invasion. In this 2008 crossover they revealed their newest trick: the ability to transform themselves to perfectly imitate the appearance of any human. Shapeshifting Skrulls seemed novel at first; Secret Invasion presented the notion that anyone could secretly be a Skrull spy. However, the writers ultimately didn't go far enough with the idea. While the Skrulls had been planting duplicates for years, they had practically no influence over the recent and controversial Civil War storyline, effectively squandering what could have been a complex and far-reaching story arc with game-changing implications. While the setup and initial subterfuge were strong, the story quickly lost steam when it was revealed that, for all their planning and bluster, the Skrulls were still pretty ineffective villains. They were ultimately defeated in a decisive battle in Central Park, with relatively little fanfare, though not before their leader killed Wasp for no reason except so they'd at least killed someone of importance before being unceremoniously curb-stomped into oblivion. Before Joe Quesada came to power and made great strides to break up famous Marvel Comics power couples, this famous late 1980s X-Men story was written with the explicit goal of getting Cyclops and Jean Grey back together after her resurrection. He had moved on following her death by marrying the lovely Madelyne Pryor, who just happened to be the spitting image of Jean. Inferno is a dense story in which New York City is invaded by demons, and Madelyne is revealed to not just bear an uncanny resemblance to Jean Grey, but to actually be her clone. Her entire relationship with Cyclops a ploy by Mister Sinister to get them to give birth to a son who will grow up to defeat Sinister's bitter enemy, Apocalypse. After being utterly devastated by this shocking truth, a broken Madelyne agrees to become the Goblin Queen and aid the demons in their takeover of Earth. 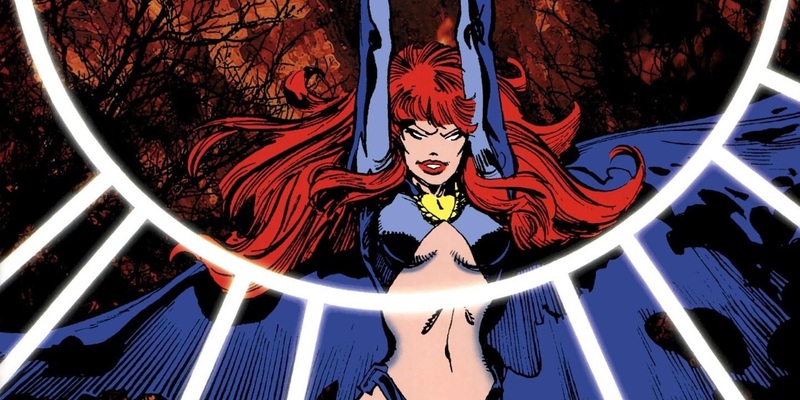 Her boundless bitterness ultimately causes her to commit suicide, and to attempt to kill Jean as well, but the Phoenix Force saves Jean, and possibly instills within her a part of the dead Madelyne's essence. Ultimately, Inferno was a really complicated way to resolve the Cyclops/Jean/Madelyne love triangle so that Cyclops didn't look like a jerk for cruelly abandoning his wife and son after his first love interest returned from the dead. Many readers have yet to truly forgive Cyclops. Oh, and speaking of their son, he would soon be sent into a brutal and violent future. We know Nathan Summers better by his alternate name, Cable. That Red Skull is always up to some devious plot or another. In 2014's AXIS, he becomes Red Onslaught, absorbing Magneto's hate by grafting a part of Professor X's brain onto his own. It's gross and fiendish, but would we expect nothing less from the Skull? 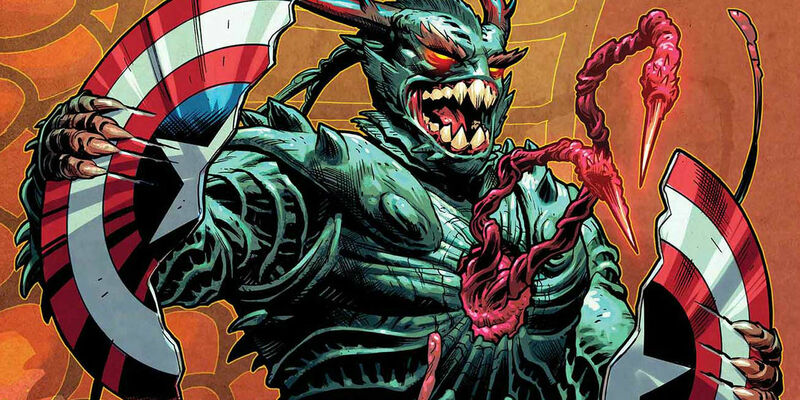 Onslaught creates a massive wave of hate which causes "the inversion," infecting the Avengers with Red Skull's evil and thereby inverting their allegiance. Captain America (Sam Wilson) goes rogue and Iron Man essentially becomes Marvel's version of Lex Luthor. Meanwhile, Doctor Doom becomes a benevolent ruler and paragon of good, Deadpool becomes Zenpool, and other villains have their opinions on good and evil reversed. Although the inversion was eventually reversed and the world saved, Tony Stark was able to protect himself, retaining his newly (or perhaps just more overtly) evil and duplicitous personality. 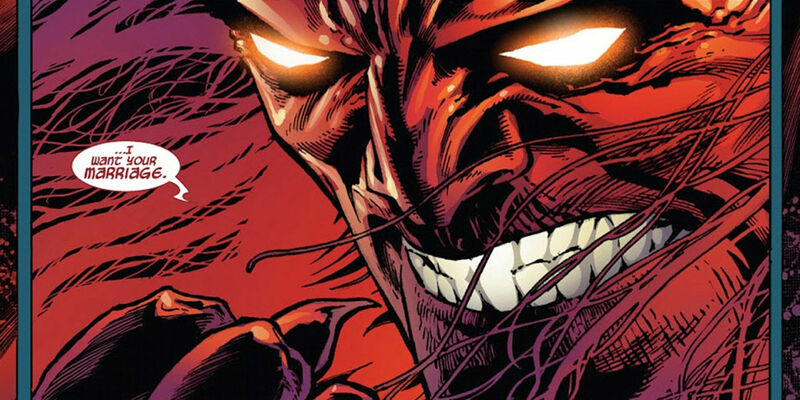 In a bit of morbid comedy, Carnage retains his vicious character traits, but is a champion for good, though his attempts at heroism usually end in comical failure. Ultimately, he sacrifices himself to save the day, but not before making Spider-Man promise to build a statue in his memory. It's a moment which perfectly balances grimness and comedy, and the AXIS story made Carnage relevant for the first time in years. Comic books are often at their strongest when dealing with the intimate, personal repercussions of grand sci-fi shenanigans; in this case, time travel. In Battle of the Atom, the original X-Men from the past are currently living outside of their own time. They meet up with the present team of X-Men, but when the younger version of Cyclops is injured, his wounds cause his older counterpart to phase out of existence, possibly instigating a catastrophic time paradox. 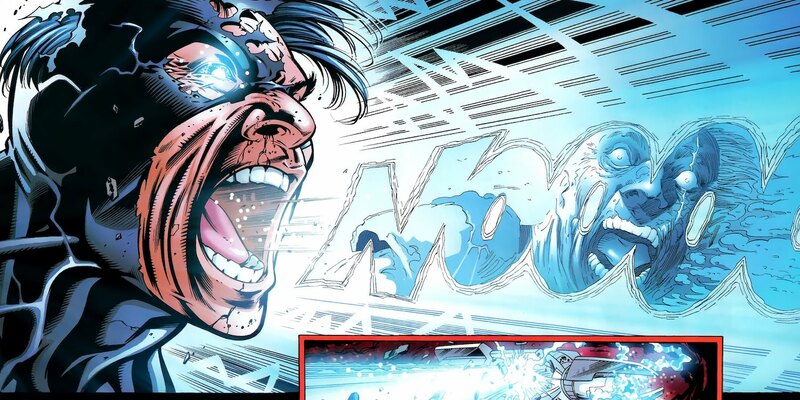 Fortunately, the mutant Triage revives the younger Cyclops, but the fear of a universe-ending cataclysm shakes the present-day mutants enough that they resolve to send the past team back their own time. Seeing potential for disaster, the present version of the X-Men decide that the classic X-Men must return to their own time. A third group of X-Men, from the distant future, appear and the debate turns into a full-on superpowered brawl, as they so often do in these types of stories. Ultimately, Battle of the Atom leaves the possible effects of the consequences of time travel up in the air, for the viewers to decide if the prospect of danger is enough to force the past X-Men team to return to their proper time. They decide to remain in the present day, but their trust with the current team is shattered, and the O5 team, as they're called, go their own way, joining forces with the Uncanny team of X-Men, and Kitty Pryde leaves Cyclops's team to join them. Whatever happens, we hope to see that supremely cool Ice Hulk one day in the future! 2009's War of Kings chronicles an intergalactic war between Inhumans, the Nova Corps, and the Skrull Empire, with humanity mostly sitting out the event. The looming threat is a Terrigen bomb, which would turn people into Inhumans, at the cost of killing those who lack the proper genetic markers. 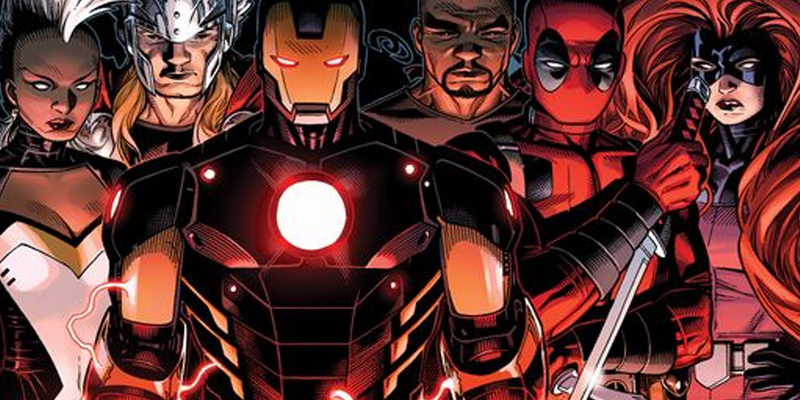 For the most part, Earth's Mightiest Heroes sit this one out too. What follows is essentially Marvel's version of a massive, Star Wars-esque Space Opera, with an endless and addictive string of battles, political intrigue, and character betrayals, ending with Black Bolt dead (but not really; he is merely badly injured and out of commission for a little while). War of Kings led to Realm of Kings, a series which ultimately set the stage for the next big event, The Thanos Imperative, in which the Mad Titan returned to life and wrecked a whole bunch of stuff before being taken down. 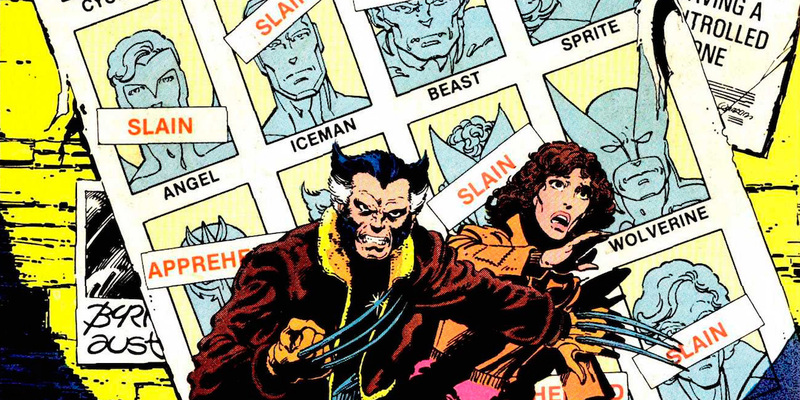 Most folks these days know X-Men: Days of Future Past as the film that brought Bryan Singer back into the X-Men fold and undid the damage of Brett Ratner's X-Men: The Last Stand, but the original 1981 story is one of the most revered X-Men comics ever written. Despite being only two issues long, the story is large in scope and features Kitty Pryde traveling back in time to prevent events that created a bad future in which Sentinels, mutant-hunting robots, have decimated and subjugated mutants and humans alike. At the end, Kitty changes the future, but we don't know learn the outcome in the story itself. 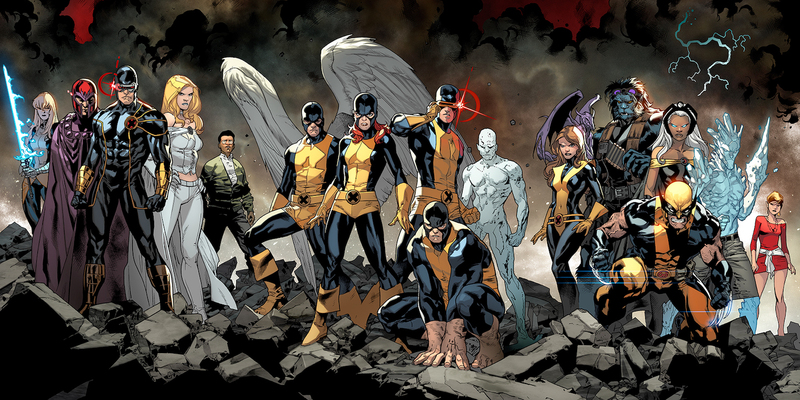 The 1990 sequel story, Days of Future Present features the X-Men and the Fantastic Four teaming up to fight a threat from the future. However, the original story's bad future was the distant future of 2013, and mutants have yet to be enslaved by robot overlords. Kitty's time-travel saved her future, but it also created an alternate timeline in which the Sentinels took control, if for no other reason than so that Marvel could continue publishing stories dealing with a Sentinel-infested future. The latest of these stories is 2015's Years of Future Past, as part of the massive Secret Wars crossover event. The original 1980s version of Secret Wars was written by Marvel Editor-in-Chief Jim Shooter in an attempt to bring every single Marvel character together in a series of game-changing battles. Secret Wars 2015 isn't a direct sequel, but it takes the basic premise of a mega mash-up and escalates it to its logical extreme, featuring the numerous alternate universes in Marvel comics colliding in a huge event, after which the multiverse would never be the same again. Secret Wars 2015 takes the Battleworld concept from the original story, and elevates it to a planet made from fragments of different destroyed universes. Multiple versions of every major Marvel character engage in righteous battle to preserve the remnants of their universe. 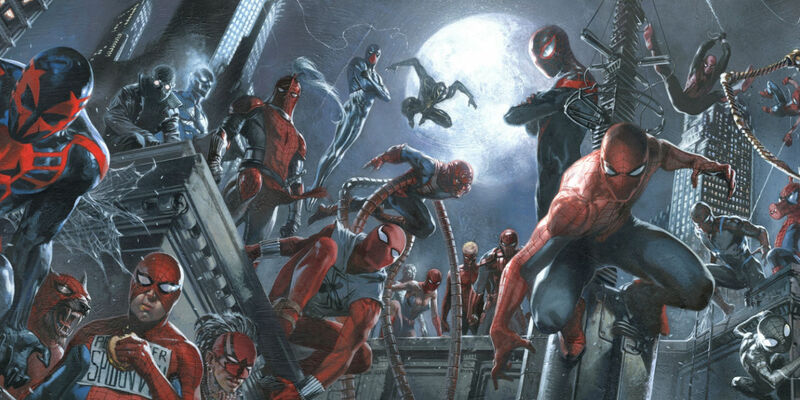 The event served to reboot the Marvel universe, and it did so in grand fashion; the Ultimate Marvel universe, introduced with Ultimate Spider-Man in 2000, was brought to an end, erased from existence. However Miles Morales, that universe's current Spider-Man, managed to transition to the mainstream 616 universe, giving at least one character in the gloomy and morbid Ultimate universe something of a happy ending. Perhaps the most infamous Spider-Man story of all time, The Clone Saga lasted for two whole years in the mid-1990s; two years that Peter Parker will never get back. The Clone Saga brought in multiple clones of Spider-Man, a slew of pointless new characters, and several supposed game-changing revelations, all of which were rejected by the fandom and promptly done away with. The 1990s Clone Saga was preceded by a 1970s story created by Miles Warren, which featured a clone of Peter Parker. Warren was a professor obsessed with his student, Gwen Stacy, and created a clone of her, as well as one of Spider-Man. The Spider-clone was seemingly killed at the end of the story, only to return in the 1990s Clone Saga, going by the the name Ben Reilly. The saga spiraled out of control, spinning its wheels and racking up surprisingly strong sales at the expense of any type of comprehensible storytelling. In the end, a suddenly-not-dead Norman Osborn showed up, having conveniently been behind the whole thing from the very beginning. Peter Parker was always the original, Ben Reilly was killed off in heart-wrenching fashion, and the whole thing was promptly and mercifully forgotten. 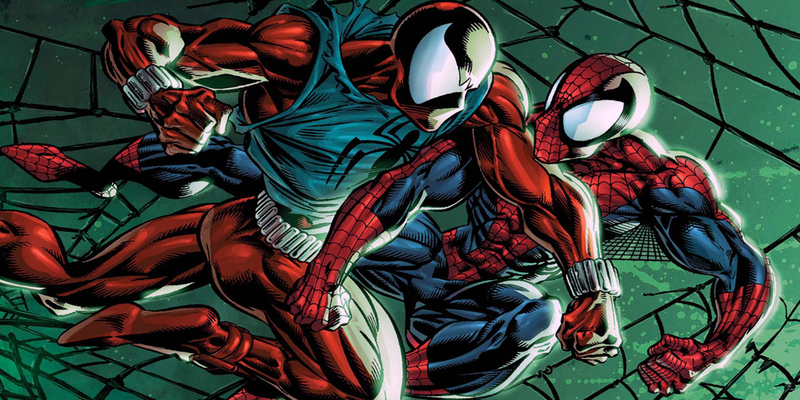 In 2009, two of the original writers of the oft-lambasted story got together to create Spider-Man: The Clone Saga, which was billed as the "director's cut" version of the story. They trimmed the fat, streamlined the story, and replaced Norman's villainous non-sequitur with an ending more in line with their original vision for the arc. What do you think? What's your favorite impenetrable Marvel story? Are there any Clone Saga fans out there? Sound off in the comments below!